The figures below illustrate the costs for the implementation of the minimum scenario which are needed in addition to the trend development as well as the required share of funding. The individual values and their derivation and significance are described on the respective measure sheets. The cost savings from a reduced energy consumption are opposed to the annualized investment costs plus operating costs. The share of funding generally refers to the volume of investment; as for conceptual or publicly funded measures, it gives the expected costs. This does not determine the recommended instrument of funding. The amount of funding is estimated on the basis of experiences with start-up financing. 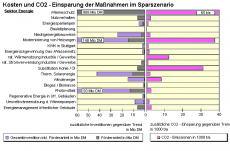 For the realisation of the CO2 reduction potential for the next 13 years determined within the minimum scenario, significant additional means would be needed beyond the investments budgeted already within the trend scenario. These would have to be raised mainly by house owners and the residents of Stuttgart. If the additional potentials of the desired scenario were to be realized for this time period as well, further means would be required, which would partly necessitate an even higher effort per amount of CO2 reduction than within the minimum scenario. in which fields the provided funds will have the biggest impact. What has to be considered in the assessment and priority setting of the individual measures is the fact that the most diverse fields profit from the arising costs. 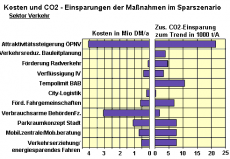 The beneficial effects of the measures are a) the immediate savings from a reduced energy consumption, which can be evaluated in economic terms, and b) the reduction of CO2. But there are further significant benefits or costs. In the traffic sector for example, there are, besides the reduction of further air pollutants (especially nitrogen oxides, hydrocarbons and particles), noise pollution, the number of accidents, time requirements and the use of vehicles. The final decision is mostly taken for other reasons than climate protection. All measures in the traffic sector which reduce the driving performance or optimize the traffic flow, for example, are primarily implemented under the aspects of mobility conservation, traffic infrastructure improvement and the efficient use of the system performance. An associated reduction of CO2 is often merely a welcome side effect. Before the topic of greenhouse gases was raised, the above-mentioned benefits had triggered the implementation of measures, such as the expansion of the local public transport system. The fuel savings as a result of the implementation of a measure provide only one contribution to the recovery of costs. An assessment of the overall effect of the measures must principally be based on a comprehensive impact analysis, which had not been provided for in the climate protection scheme. This is the only way for a comparison between the costs and benefits of a measure as well as the allocation to the various parties affected (transport operators, traffic participants, citizens, public authorities, public utilities, the entire society). Only then will an objective assessment of the significance of a particular measure's contribution to the reduction of CO2 be possible within the overall context.